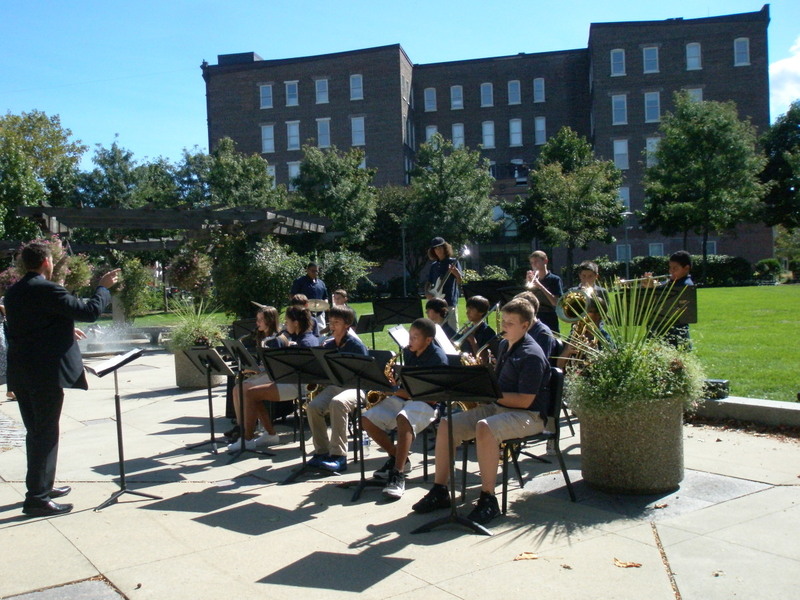 I was kind of holding my breath as the commemorative service got underway in Smith Plaza yesterday morning. I’m sure I wasn’t the only one, scanning the good-sized crowd, trying to gauge how many were there, and whether their numbers would swell or dwindle as the daylong community events, spearheaded by the Pottstown School District and the Pottstown Arts and Cultural Alliance, played out. 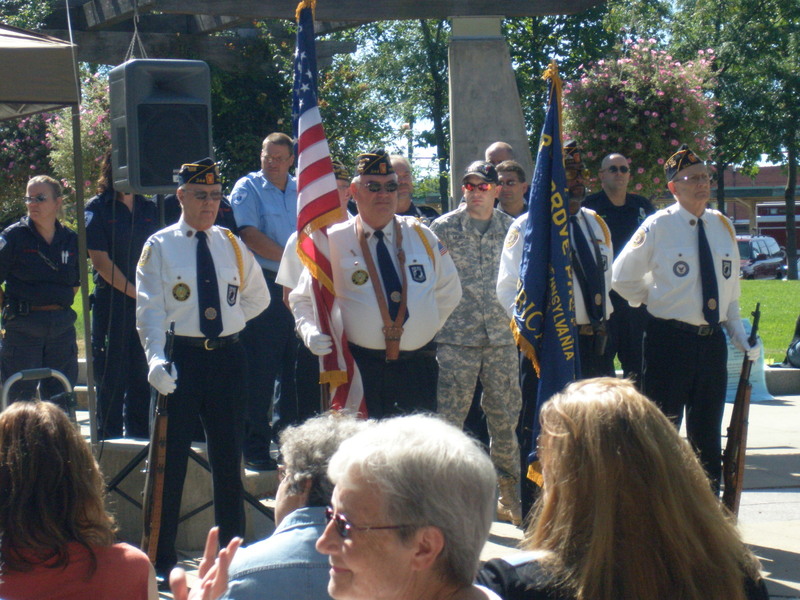 After heartfelt speeches, memories of that fateful day in 2001, the honoring of service and rescue personnel, and a moving poem by Ron Downie, I headed up High Street with fellow blogger, Mo Gallant, who writes Pottstown’s Blog. I’d already set up my puzzle- and community-building activity at the Pottstown Regional Public Library and we were going to finish setting up on the sidewalk in front of The Gallery School. That feeling of wonder only grew in strength as the day unfolded. After putting some stuff in my car, which was parked for free all day in front of the Tri-County Performing Arts Center, Mo and I popped in for a quick hello to Executive Director Marta Kiesling. Then, at an outdoor table at Juan Carlos Fine Mexican Cuisine, we indulged in the sublime Mexican egg rolls with honey jalapeno dip and their spicy Mexican Caesar salad. As it got closer to three o’clock, Mo and I bid farewell (Thanks, Mo! Thanks, Michele, for looking out for the puzzles!) Then I headed to the Library to make a quick stop and see how things had gone over there. On my way up High Street, I slowed down to take in the crowd and the thumping salsa beat in front of SwingKat and Grumpy’s Handcarved Sandwiches. Music! Joy! Dancing in the streets! 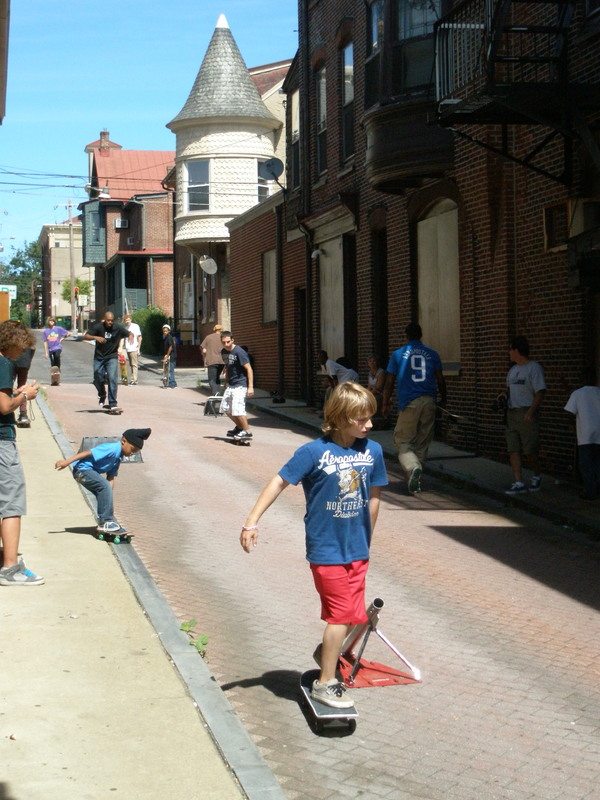 This was Pottstown on September 11, 2010. Mark it on your calendar. Imprint it on your souls. 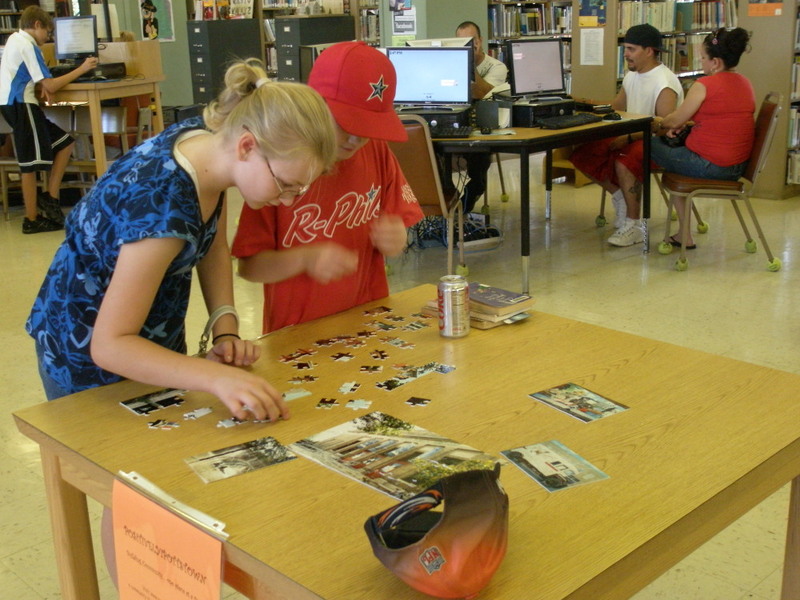 The puzzle report from Mike Packard at the Pottstown Regional Public Library was thumbs-up. If you haven’t been to the library recently, it’s got a whole new look inside, with the fiction downstairs and popular and current fiction on display. Check out the way-cool teen room downstairs. And there was popcorn! In the library! The smell was heavenly. If they keep this up, they’re going to give the big bookstores a run for their money. I made my way to the high school where school district volunteers and staff had lined the cafeteria and halls with tables for any community and school group that wanted to participate. I set up my puzzles and free book raffle in the cafeteria and never got a chance to see the hallways filled with people, including elected officials from both Borough Council and the School Board. In addition to all the families and young puzzle fanatics who stopped by, there was Erica Weekley of the Borough’s economic development staff, and Tim Phelps of Tri-County Area Chamber of Commerce and his family. In closing, I’d like to hearken back to my blog post of August 8 – The work of the community. From a community revitalization perspective, yesterday was a HUGE bump up to the next level. The community sees the positive and good things it’s capable of. You never know when that’s going to happen – that breakthrough – but once it has, in a lot of ways there’s no turning back. While yesterday provided the community with a long moment of harmony, where the results of true teamwork were visible and palpable, every day isn’t going to be like this. But the more of these moments that you can string together, the better prepared you will be to get over the rough spots in between, together, with ultimate faith and trust in each other. 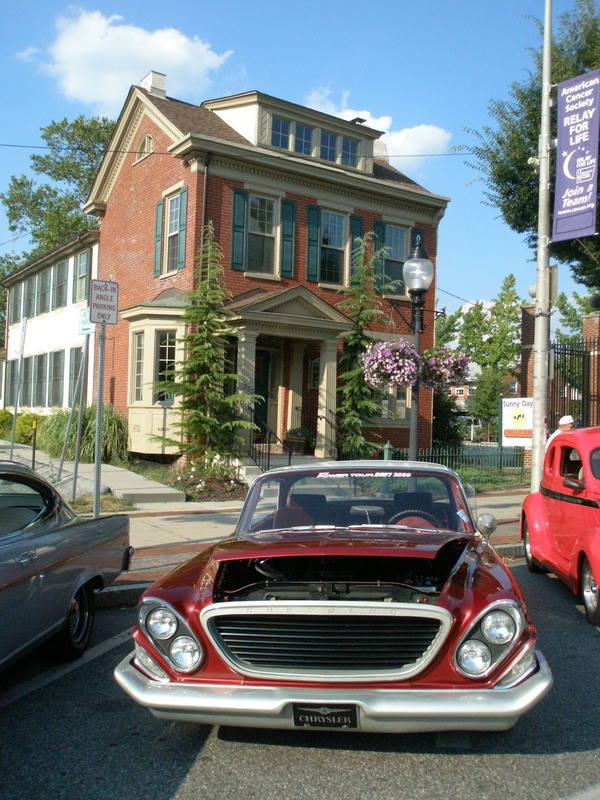 Congratulations, Pottstown – you’re awesome! Excellent post, Sue. It was a great day in the Borough yesterday! Thanks Chris! Yeah, it was so much fun! Anyone see Sparky Grimes there? Long live the spirit of Sparky Grimes! Hey Sue, Is there something wrong with me if I keep noticing the back of my own head when I look at the photo of the American flag? My hair takes up an 1/8 of the image. I really had a fabulous time-Now when can we go get more Mexican egg rolls? For what it’s worth, I had a hard time being the impartial observer Saturday as I was so pleased to see the turnout. My observation was that places that had music playing outside were really attracting people and I don’t wonder if we couldn’t have more of that. If I’m not careful, I may end up trying swing dancing soon, although someone’s toes are bound to suffer. We faced a real dilemma at the newspaper with the drug bust that happened early in the morning but I was pleased at the decision by editor, Nancy March (who came in from a relaxing weekend at home to make the call) to put that inside the paper and not on the front page so that Pottstown could enjoy a day in which only its positives were emphasized on the front page of The Mercury. Like Sue R., I was holding my breath and hoping (praying — hard to do for an agnostic) that all this buzz would not be vain. I think part of it is due to efforts like this blog and Mo Gallant’s and Code Blue., which all helps to keep conversation and engagement bubbling and what we need to do. I saw Sue and Mo shooting the breeze with the mayor and Jason Bobst and Leighton Wildrick at Juan Carlos, and all this talk of Mexican eggrolls has my tongue hanging out. Hoping to plan a night downtown at Juan Carlos and Tri-Pac soon with my wife and I.
BTW, Funky Little Kitchen got a thumbs up in Zagats, Mike Falcone reported on Facebook. Let’s keep the momentum rolling. Watch The Mercury for a report on Leighton’s presentation to borough council recently. It will really shine a light on things downtown (that’s your only hint). It would be tough to be impartial yesterday. I’m so glad to hear about the decision to go with the positives on the first page. Thank you, Mercury! I see the online version so I don’t get the same impact or quite know what appeared where in the print edition. I went to Funky Lil Kitchen several weeks ago and still need to get a review up. Also have a gift certificate to give away at some point. It was really nice and I want to go back with my family. Hope you and your wife can get out for a night on the town soon!